After their 2013 Annual General Meeting last weekend, the Football Association of Ireland took the unprecedented decision not to hold a press conference, effectively enforcing a media blackout. There were no questions permitted from the floor during the meeting and the chairman and Finance Director’s presentations were uninterrupted. Interlocutors were eager to discuss the FAI’s financial situation. With outstanding debts of €63m, which the organisation is repaying on an interest-only basis and an operating surplus of just €25,000 in 2012, concerns appear to be well-founded. However Chairman John Delaney, with characteristic bravado, insisted they are on course to be debt-free by 2020, citing a range of apocryphal TV rights and commercial deals which will account for the operation’s future prosperity. 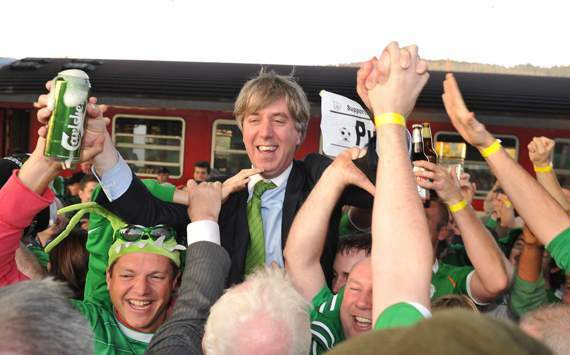 The FAI are heavily subsidised by the Irish taxpayer through grants from the Sports Council, however there seems to be little accountability or transparency with regard to their financial position. For years the organisation has been run as a private fiefdom by Delaney and his cronies and yet the Sports Council continues to throw money at the FAI, effectively subsidising Delaney’s exorbitant €400,000 annual salary – more than the Taoiseach Enda Kenny earns. And the fortunes of the Irish soccer team mirror those of our present government. A bunch of muppets running around, getting humiliated by the Europeans, delivering disappointing results, with bleak prospects; while their fans continue to turn up hoping next time will be better and if it isn’t sure we can still get drunk. This entry was posted in dail eireann, Economy, Ireland, journalism, Media, Politics and tagged AGM 2013, debt, enda kenny, FAI, Financial results, John Delaney, Sports Council. Bookmark the permalink. €400,000 annual salary? I had to look at it twice.